Planning your next meeting, reunion or banquet? With both large spaces like the Lake Granbury Conference Center, or small spaces such as a venue for a banquet or family reunion, you can find it in Granbury. Groups gathering in Granbury can expect much more than the perfect meeting facility. Your group can gain as much from their offsite experiences as their planned meetings and event! 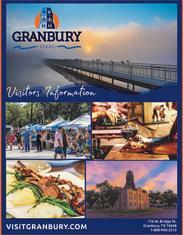 From the many wineries, breweries, historic sites and museums, outdoor activities and live entertainment – Granbury has an array of experiences to make your event top-notch.